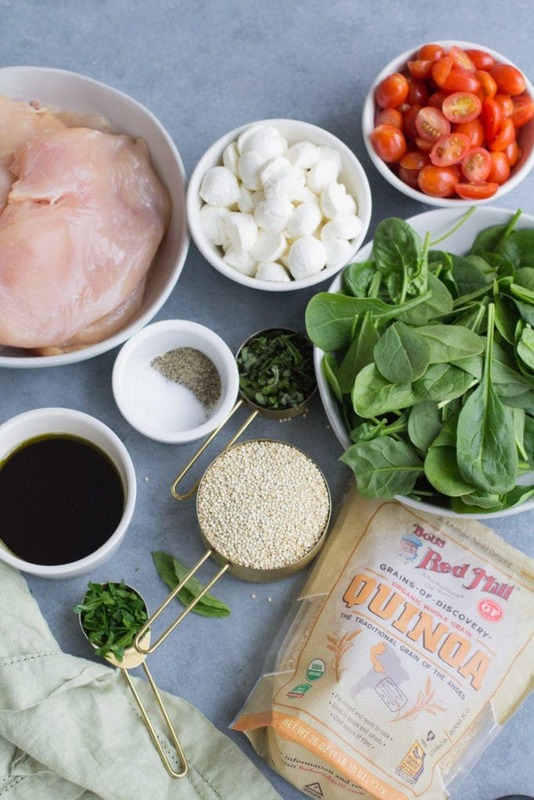 Healthy Chicken Caprese Quinoa Meal Prep Bowls are a delicious meal for lunch or dinner. Naturally gluten free, hearty and easy to make! This post is sponsored by my friends at Bob’s Red Mill. Do you like really delicious food? Do you feel like you barely have any time to cook? Are you sick of Sad Desk Lunches? Are you looking for an easy and healthy snack to take on the go? 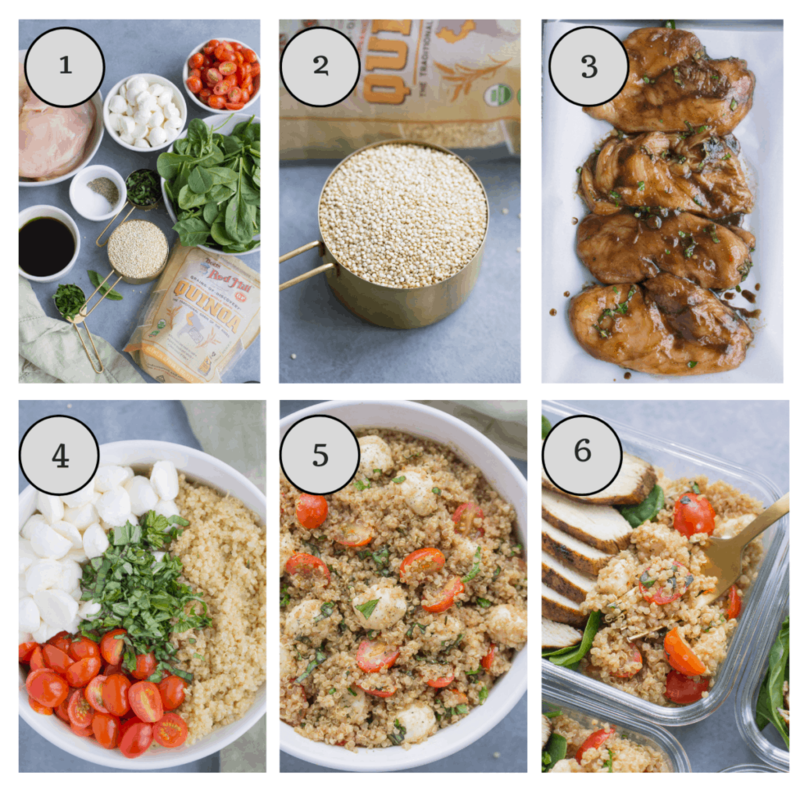 If you answered yes to any of those questions than these Chicken Caprese Quinoa Meal Prep Bowls are for YOU. 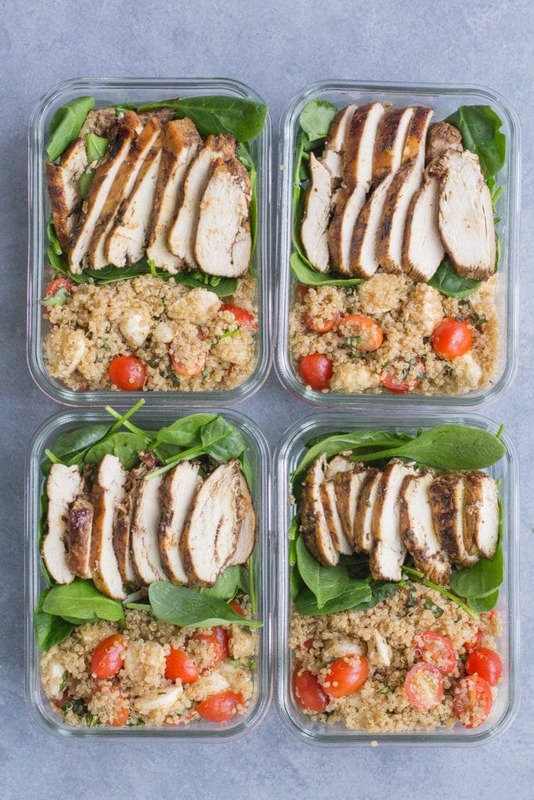 These Chicken Caprese Quinoa Meal Prep Bowls require under an hour to make, are loaded with flavor, and are so perfect for planning out your meals for the week ahead. 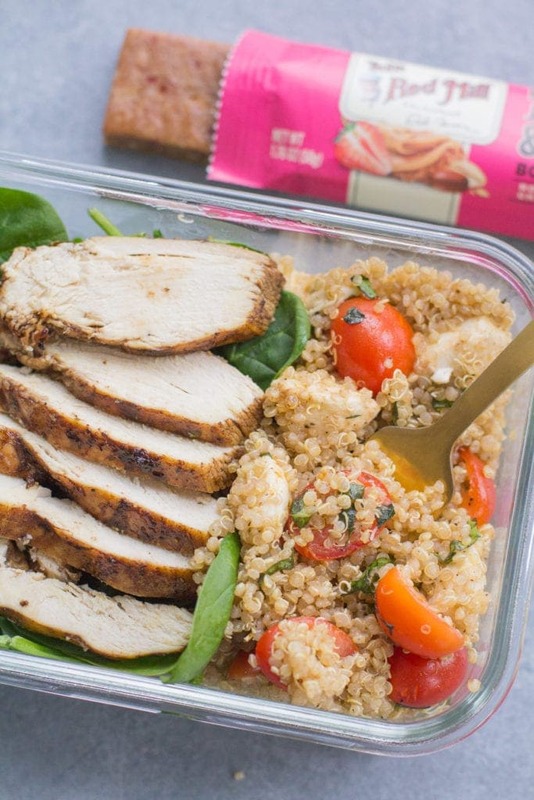 These bowls are jam packed with balsamic chicken, spinach, hearty quinoa, creamy mozzarella and ripe cherry tomatoes. It’s pretty much the ultimate flavor combo! These meal prep bowls really are SO simple to make. Step 1: get all your ingredients ready + cook your quinoa per the directions on the back of the package. Step 3: While chicken cooks, prep remaining ingredients for quinoa salad. Once quinoa has cooked, allow it to cool slightly. Step 5: Assemble bowls + enjoy! If you want to take your meal prep a step further.. why not plan your breakfast and snack ahead of time too?! 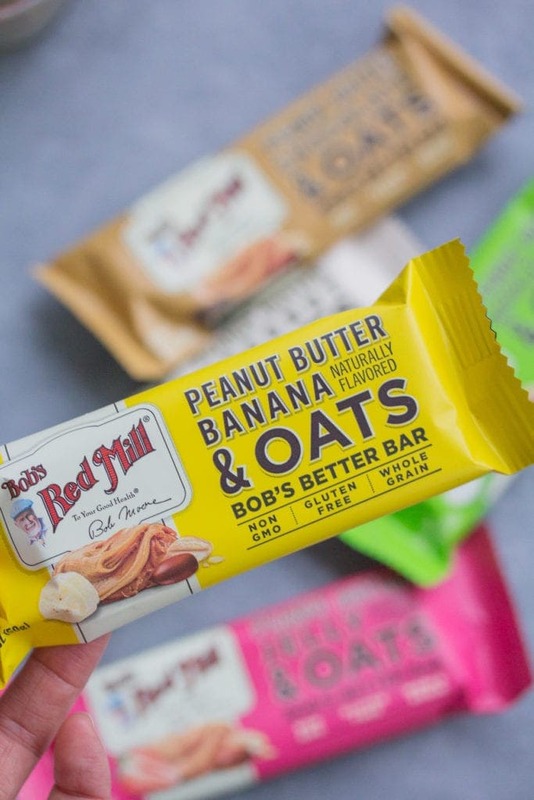 Bob’s Red Mill recently came out with their Bob’s Better Bars and they are perfect for snacking or for a grab and go breakfast. This one is seriously SO GOOD. The chocolate peanut butter is my second fav! We love that these bars aren’t loaded with sugar, and instead are packed with whole grains and wholesome ingredients meant to fill you up. Thanks to these bars you can have breakfast and lunch, or lunch and an afternoon snack all planned out in basically no time! Throw some veggies or fruit in a bag + you’re set up for a full day of healthy meals! Cheese– You can sub mozzarella for feta or goat cheese. I would sub with 3/4 cup instead of 8 oz. Greens– I like these meal prep bowls with spinach but arugula, spring mix, or any greens will work well! Protein – I haven’t tried it, but I’m sure these bowls would be great with fish instead of chicken. You’d just need to adjust the cook time depending on what you swap. Dairy free– To make these dairy free, simply omit cheese. These meal prep containers are my favorite. We use them every week and they go right in the dishwasher with no problems. 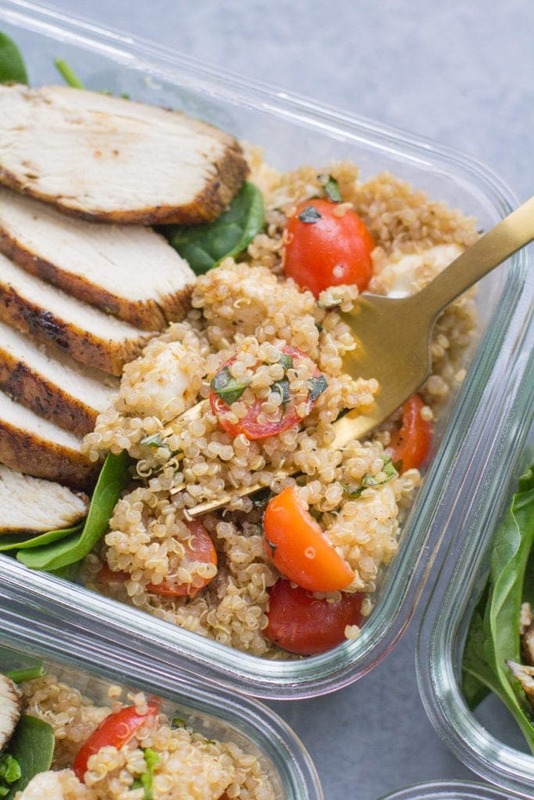 You can store these chicken caprese quinoa meal prep bowls for up to 5 days in the refrigerator. 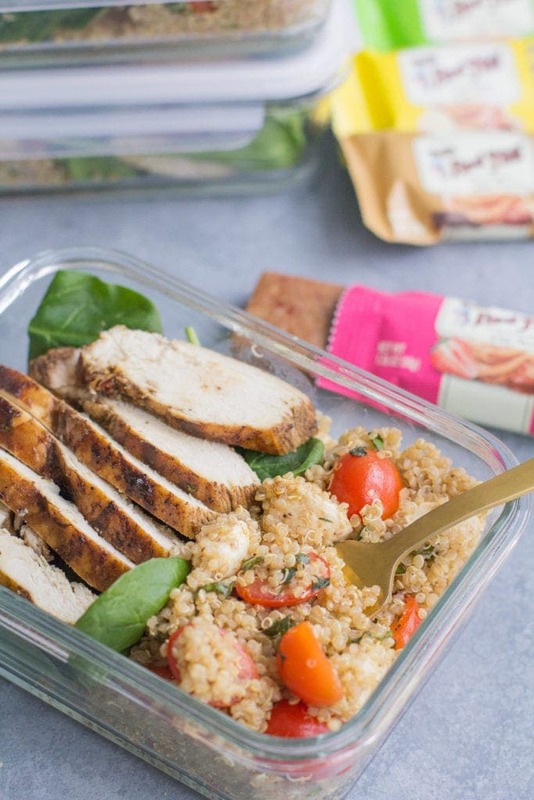 Healthy Chicken Caprese Quinoa Meal Prep Bowls are a delicious meal for lunch or dinner. Naturally gluten free, hearty and easy to make! Preheat oven to 450 + prepare a parchment lined baking sheet. To cook quinoa, bring 2 cups of water to a boil. Add in 1 cup of dry quinoa into the pot, stir, and return to a boil. Cover and reduce heat to medium, simmering until all water has absorbed (about 10-12 minutes). While quinoa is cooking, prepare chicken marinade. Coat chicken evenly in marinade, and place on parchment lined baking sheet. Bake chicken at 450 for 20 minutes. While chicken is baking and quinoa is finishing cooking, prep all remaining ingredients for the quinoa and add to a bowl. Allow quinoa to cool completely. 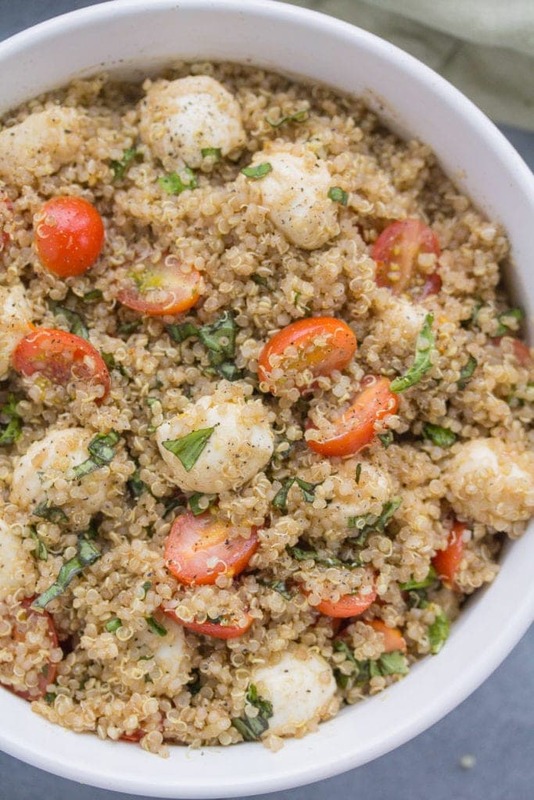 When quinoa is completely cooled, toss all ingredients for quinoa salad together gently + serve cold! 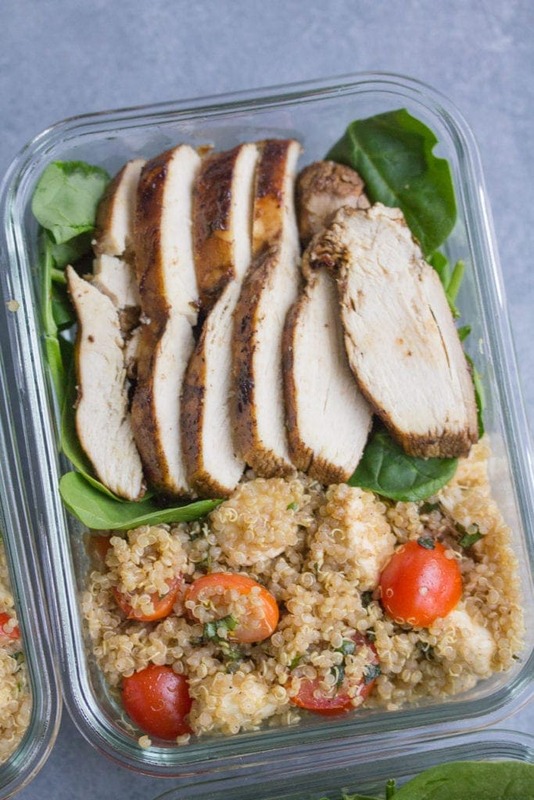 Assemble bowls with quinoa salad, a generous serving of spinach, and sliced chicken on top. Cheese- You can sub mozzarella for feta or goat cheese. I would sub with 3/4 cup instead of 8 oz. Greens- I like these meal prep bowls with spinach but arugula, spring mix, or any greens will work well! Protein - I haven't tried it, but I'm sure these bowls would be great with fish instead of chicken. You'd just need to adjust the cook time depending on what you swap. Dairy free- To make these dairy free, simply omit cheese. These meal prep containers are my favorite. We use them every week and they go right in the dishwasher with no problems. You can store these chicken capresee quinoa meal prep bowls for up to 5 days in the refrigerator. So happy to hear this, Jessica! It’s one of my favorites to meal prep! Hi Shane – yes, these are good hot or cold! I actually prefer them cold.